I promise not to mention my birthday anymore, but just had to show you what has just arrived, a large box of wonderful chocolates, yummy, and blow the diet, LOL. Thanks Keith, Martin, Leona and my little man Jake. Its now back to work after a great 4 day birthday party. A really big thank you to everyone who sent me birthday wishes, I really do appreciate them, Thank you, does not really put it in words, but they all mean so much to me. I have really been set up by Keith and my sister Elizabeth, what with the newspaper announcement, then to my great surprise, Elizabeth turned up at my front door to come and stay for a couple of days. She has taken me shopping and tonight the 3 of us will be having a nice meal. I had some wonderful presents, and have been told that the postman is bringing some more later on in the week, can't wait. The bad news is that I can't get my bus pass for a couple of years yet, what a cheek, changing the rules when you get older. Keith here, I do not know how this appeared in our local paper, LOL. 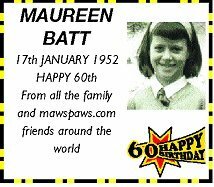 You wouldn't believe this was Maureen when she was much younger, hehe.